Council is also committed to the implementation of Melbourne’s Principle Bicycle Network (PBN), which includes a mixture of on road cycle lanes and shared cycle paths. The Victorian Government is also an active proponent of cycling as part of Melbourne’s transport strategy. A detailed proposal for the Eastern Rail Trail was prepared in June 1996 by the Cities of Boroondara and Whitehorse and the Department of Sport and Recreation Victoria. The Eastern Rail Trail was identified and an important link in the Principle Bicycle Network for Melbourne. It was specified as one of the four radial routes identified by the State Bicycle Committee to link the outer suburbs with the City. Unfortunately, this proposal has not been implemented to date. 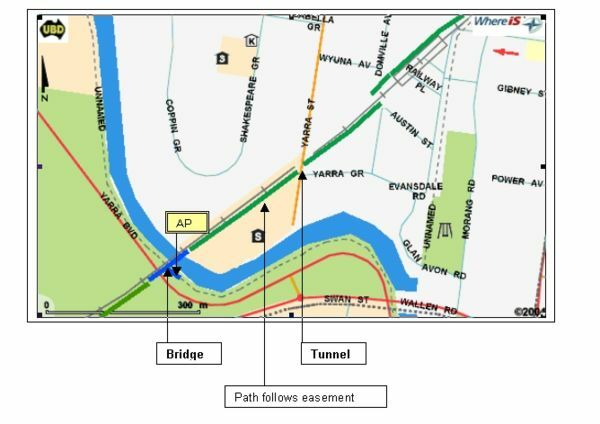 Good shared bicycle paths are now available along the Gardiner’s Creek and the Eastern Freeway, both of which now connect with the Main Yarra Trail. While these paths are heavily used for both recreational and commuting purposes, they tend to follow major creek routes and do not service large sections of the inner eastern suburbs corridor well for travel in east-west directions. Considerable progress has been made over recent years on implementing both on road lanes (such as Union, Balwyn, Mont Albert and Kilby Roads) as well as marking of wide left lanes (such as sections of Riversdale Road). 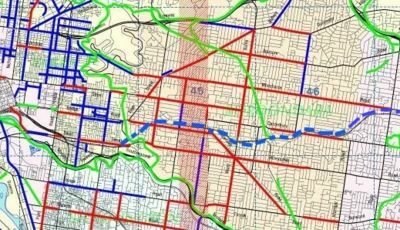 However, there is a lack of direct east-west “bicycle friendly” routes through the City of Boroondara to central Melbourne. The routes with wide left lanes such as Riversdale, Barkers and Burwood Roads frequently carry very heavy traffic, with narrow points at traffic light controlled intersections and many tram stops. These narrow points are very intimidating to casual cyclists and are a major deterrent to them making cycle trips along these routes. 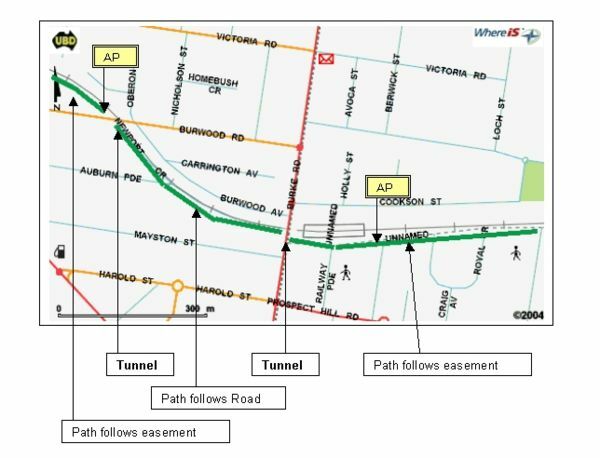 The Eastern Rail Trail will provide a bicycle path shared between cyclists and pedestrians (but not motor vehicles), that will provide an excellent opportunity for cyclists to travel through the City of Boroondara to connect with the Main Yarra Trail and the bicycle route along Bridge Road. Recreational cycling on weekends and during evenings – including visits to the growing local café and shopping areas such as the Glenferrie Road, Camberwell Junction, Maling Road and Union Road strips. This has significant potential to boost local tourism by connecting with Melbourne’s existing heavily used bicycle paths along the Yarra River. The path should accomodate both pedestrians and cyclists. Students attending local schools such as Camberwell High School, Strathcona, Fintona, Carey and several primary schools. Cyclists would have a fast and efficient alternative route to Whitehorse Road (Tram 109), Barkers, Burwood, and Riversdale Roads, which would improve the flow of traffic and trams. Increased cycle trips and a reduction in car trips would significantly reduce both traffic congestion and associated air pollution. 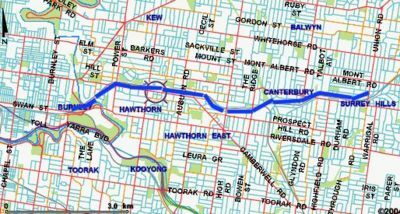 The suggested route follows the Box Hill railway line from Surrey Hills station over the Yarra River to the Main Yarra Trail and Swan Street. Most of the route can be situated on or next to the railway easement, which will offer unimpeded and enjoyable cycling. This proposal focusses on the section of the railway line between Mont Albert/Surrey Hills and the Yarra River. There is also an excellent opportunity to extend the Eastern Rail Trail connection further east along the Lilydale line through Box Hill out to Mitcham and beyond. 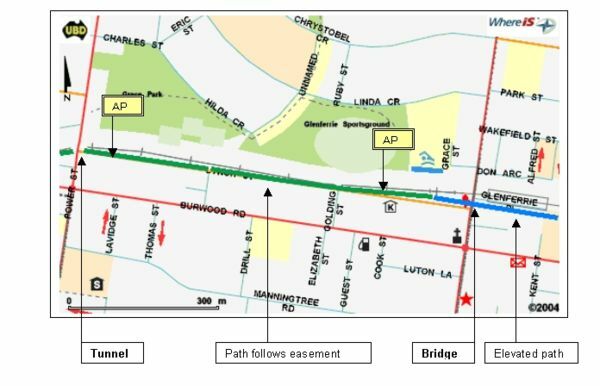 Some good sections of cycle track currently exist along sections of this line, but they currently do not integrate or connect well with good cycle routes through Boroondara. The Principle Bicycle Network provides a master plan for improving cycling amenity in Melbourne. Currently there are only wide left lane cycle routes travelling east west through the City of Boroondara (designated by red routes in the above map). The off road paths (green routes) along the Outer Circle Trail, the Eastern Freeway and Gardiners Creek to do not provide direct travel to and from the city from suburbs such as Mont Albert, Balwyn, Hawthorn, Surrey Hills, Camberwell and Canterbury. 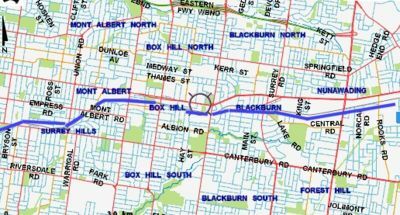 The proposed Eastern Rail Trail (dashed blue line) will complement all these PBN routes by providing more direct east-west cycle travel through the City of Boroondara. 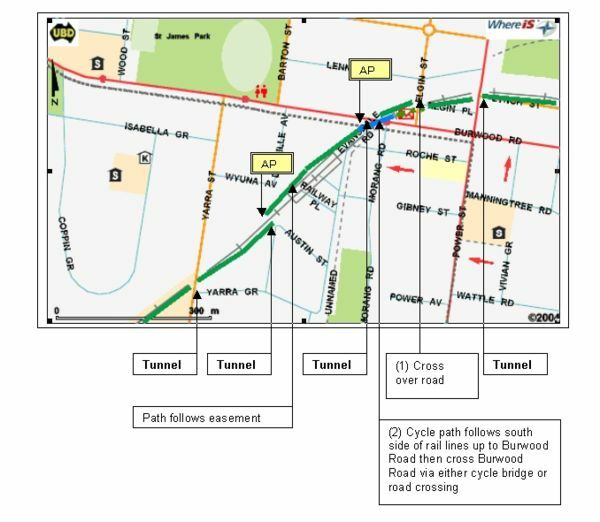 In Camberwell, the path would be best positioned along the south side of the railway line below the existing pedestrian footway, under Stanhope Grove bridge and along the embankment on a platform. 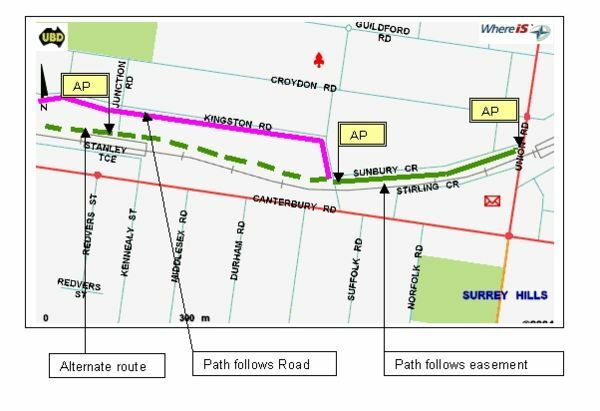 At Camberwell Station, the path would be best routed through where the railway holding yards currently are, under Burke Road via a tunnel and up onto Auburn Parade, to continue on the South Side of the railway. 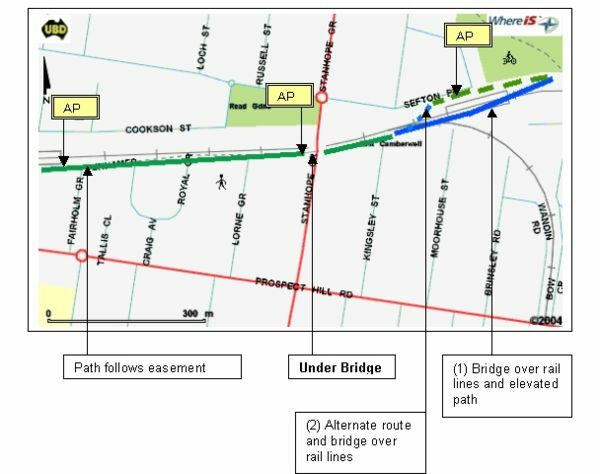 There is then sufficient space on the railway easement and provision on all existing rail bridges over roads to accommodate an elevated path all the way to Hawthorn Station. 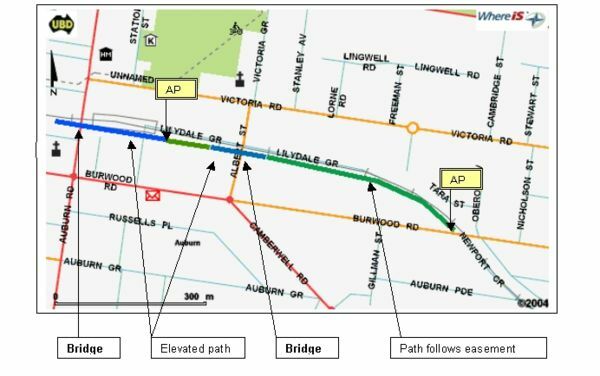 Boroondara Council are requested to make allowance for this path during the planning for the redevelopment of the Camberwell Station area. If it is not accommodated during redevelopment then this opportunity will be lost. Details for the suggested route location are provided in the following sections. The unused rail easment next to platform 1 at Box Hill Centrail station could be used for cycle transit under Box Hill Central. There is currently no safe or convenient bicycle route through the Box Hill Central area. The bridge over Elgar Road is necessary to maintain the trail grade and transit over the very busy Elgar road without disruption to traffic. The path can transit Mont Albert Station car park. The railway easement narrows at this point. 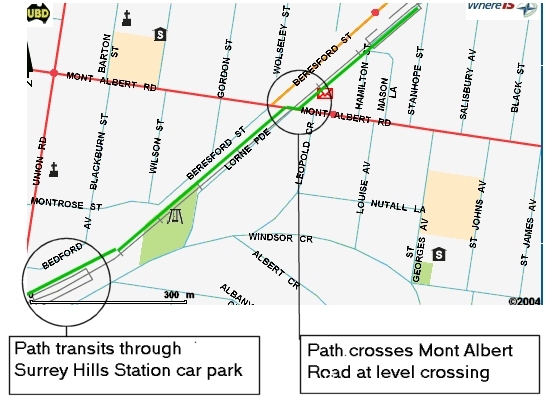 The easiest option for crossing Mont Albert Road is via the existing level crossing. The path can transit Surrey Hills station car park. The railway easement narrows at this point. The easiest option is to cross Union Road at the level crossing. When grade separation is provided at this crossing, the trail should be seperated from the road. Alternate route marked along railway easement may be feasible, but it narrows near Chatham railway station. 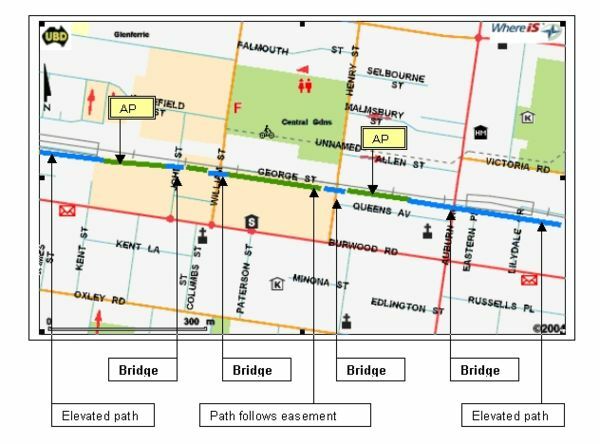 Bridge over Canterbury Road is urgently required to provide alternate route for cyclists who currently have to cross Canterbury Road and are not permitted to use the footpaths near the pedestrian lights. This is a very dangerous region for cyclists due to heavy traffic and restricted road space. 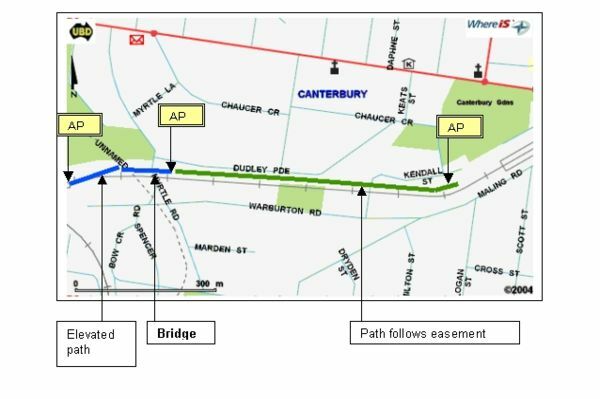 This bridge would also provide improved amenity for pedestrians wishing to cross Canterbury Road – steps for pedestrians could be added on either side. Elevated cycle path past Canterbury station above the existing car park to minimise impact on car parking and pedestrian access to the station. Bridge over Myrtle Road to prevent disruption to car traffic. Connection to Outer Circle Trail required. Path to go under Stanhope Grove road bridge through existing opening under bridge. Path continues along route below the existing foot path. This section of the cycle path is for cyclists only as pedestrians have an alternate route. Tunnel through Camberwell station development is required. Tunnel under Burwood Road is required. Path follows railway easement along area reserved for “fourth track” along the south side of the railway lines. This minimises impact on station areas and roads crossed. Tunnel required under Power St. Tunnel under Burwood Road required. Tunnel under Yarra St required. Bridge support available for cycle path across Yarra River. 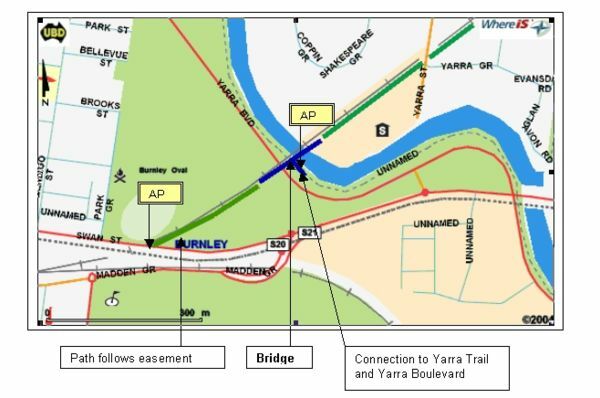 Connections to Main Yarra Trail and Yarra Boulevard required. The Eastern Rail trail route lends itself well to phased developments. Provision of selected sections of the trail will provide early benefits to local users. Eventual completion of the trail will provide benefits to commuters and cycle tourists. This page was last modified 09:18, 23 February 2013. This page has been accessed 102,988 times.